Locals flocked to the Sebastopol Inn Community Pub Decision Meeting at Minting Village Hall last night. Following excellent presentations from the Working Group, a director of the Hudswell Community Pub and a question and answer session, “Expressions of Interest” forms were handed out. 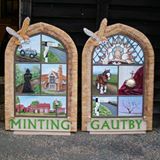 The same form can be downloaded from http://mintingandgautby.co.uk/sebastopol-inn-community-pub/ or a Survey Monkey form can be completed online from the same webpage. For those who were unable to attend last night there is a drop-in session on Saturday 10:00 – 12:30 at Minting Village Hall. Survey forms should be returned or filled in by Nov 25th, or sooner if possible.